Tim is a prolific songwriter, with over 225 songs recorded. He was named IBMA’s 2014 Songwriter of the Year. In addition, he is a sought-after studio musician, having recorded with over 75 artists in addition to Blue Highway, including Willie Nelson, Kenny Chesney, Jorma Kaukonen, Jesse McReynolds, Benny Sims, Marty Raybon, Joe Isaacs, Ronnie Bowman, Charles Sawtelle, Tony Trischka, Larry Sparks, Jim Mills and others. Tim was named SPBGMA Guitar Performer of the Year in 2001 and 2015. 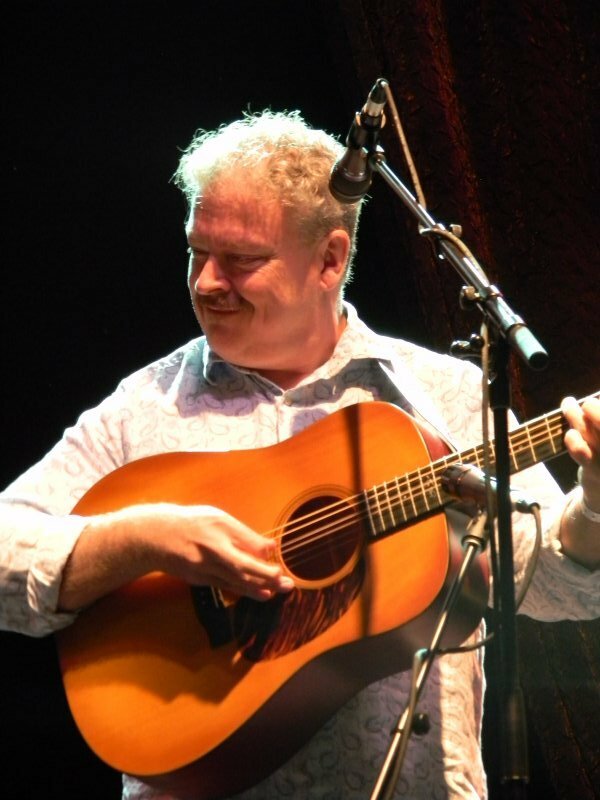 He has produced many award-winning records for various artists, including Kenny Chesney, The Infamous Stringdusters (IBMA 2007 co-album of the Year) , and Knee Deep in Bluegrass, the Acutab Sessions (IBMA 2001 Instrumental Recorded Performance of the Year). Tim performed many times with Hazel Dickens, including the Lincoln Center in New York (2006), Sundance Film Festival, Park City, UT (2005), Hardly Strictly Bluegrass, San Francisco, CA (2010), Wintergrass, Tacoma WA (2003). He has taught at every major bluegrass-oriented camp, including Rockygrass Academy, Camp Bluegrass (South Plains College, TX), Augusta Heritage, Wintergrass Academy, Sore Fingers (UK), Bluegrass at the Beach, Nashcamp, Kaufman’s Flatpicking Camp, California Bluegrass Association Camp at Grass Valley, St. Louis Flatpick, Resosummit, Summergrass Academy, Grand Targhee, Bluegrass Masters Weekend, and Nashville Flatpick and Songwriting Camp. Besides being a founding member of the wildly popular, three time Grammy nominated modern Bluegrass band ‘Blue Highway’, Tim is also a sought after session guitarist, producer, songwriter and teacher, and he has taught at every major Bluegrass, and Songwriting-orientated camp in the USA. Blue Highway has earned 26 collective IBMA Awards, 6 SPBGMA Awards, one Dove Award, and three Grammy nominations as a band, plus two Grammy awards among its current members. Blue Highway was voted the ‘Favourite Bluegrass Artist of All Time’ by the readers of Bluegrass Today in April 2016.